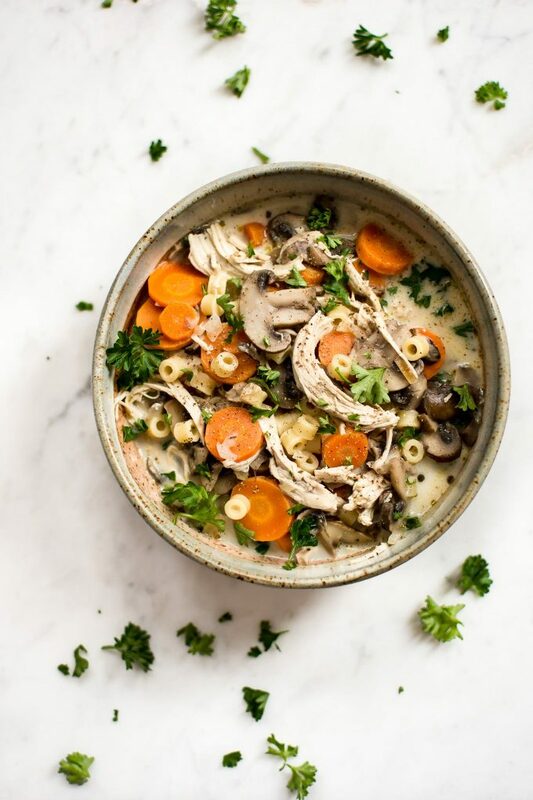 This easy healthy chicken and mushroom soup recipe is hearty and flavorful. It’s also a great way to use up leftover chicken and comes together in just over 30 minutes. Sauté the onion until softened in a large soup pot. Add the mushrooms and garlic to the pot and cook for 5 minutes. Add the carrots, seasoning, and liquids to the pot and bring to a boil. Once boiling, add the pasta and chicken. Cook for 10 minutes or until the pasta is done and the broth has thickened a bit. Stir in the half-and-half and season with salt & pepper as needed. Warm through. 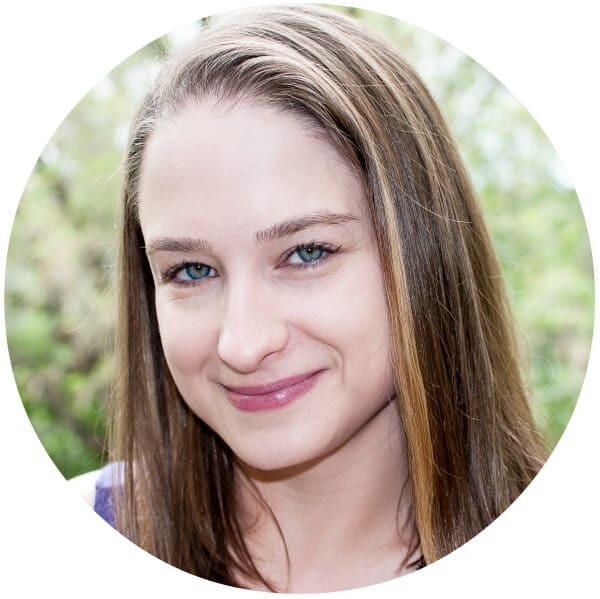 Pro tip: I used crimini (or cremini, depending on what you read!) mushrooms, but as always, feel free to sub your favorite mushrooms or whatever you have on hand. Portobello mushrooms would give this soup an even richer taste. White mushrooms would work too. I used half-and-half in this mushroom and chicken soup to give it a touch of creaminess. You could use heavy cream if you wanted an even creamier feel, but I was going for something satisfying yet still light. We’ve got plenty of goodies in here like sweet carrots, hearty pasta, and onions. It all melts in your mouth. This quick meal will warm you right up! Hope you try this creamy chicken and mushroom soup recipe! 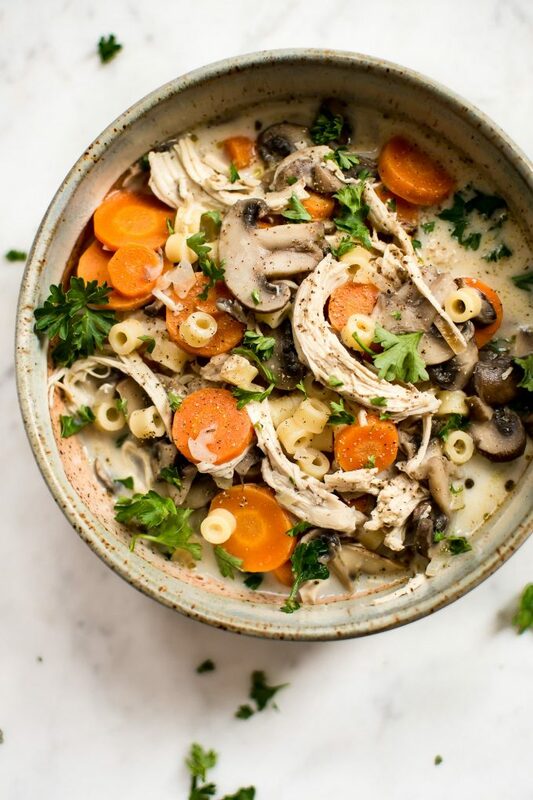 If you are looking for more chicken and mushroom recipes, you may also like my creamy spinach chicken tortellini soup, my rustic chicken and mushroom stew, my creamy mushroom chicken, or my chicken meatballs in a mushroom sauce. 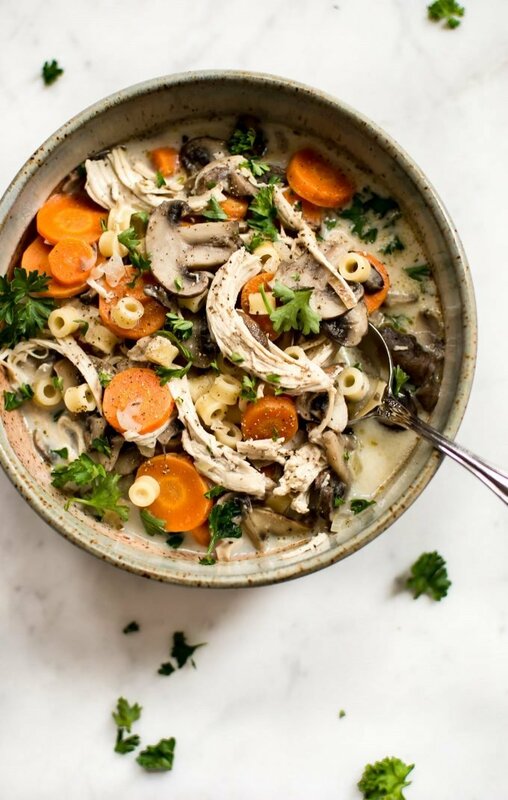 This healthy chicken and mushroom soup recipe is hearty and flavorful. It's also a great way to use up leftover chicken and comes together in just over 30 minutes. Add the olive oil and onion to a large soup pot over medium-high heat. Sauté for 5 minutes. Meanwhile, chop the mushrooms and carrots. Add the mushrooms and garlic to the pot and sauté for another 5 minutes. Add the carrots, Italian seasoning, chicken broth, and water to the pot. Increase the heat to high and bring to a gentle boil. Add the pasta and chicken to the pot. Reduce the heat to medium and simmer for 10 minutes, stirring occasionally so the pasta doesn't stick to the bottom of the pot. Add the half-and-half and salt & pepper. Cook for another 5 minutes. The carrots should be cooked by now, but if they're not, give it another few minutes. Such a cosy and comforting recipe! Love how quick this is too! Hi you need to make this without chicken for me by lunchtime. I need soup. It’s cold out. Looks really hearty Natasha! My husband would love this! If you omit the pasta, can you freeze this? So pleased you liked it!! I just sent you message asking what half and half is. I also discovered all sorts of discussions going on about what UK equivalents are – my favourite is what we call ‘creme fraiche’, which I’ve always used for milky/creamy-fying stews, sauces etc. Do you have that in Canada? Hi Robbie, I did reply to your comment on the other recipe (chicken tortellini soup) explaining what it was (it’s half milk and half cream – a USA/Canada thing). And yes, there are so many differences when it comes to creams between even the US and Canada, let alone adding the UK into the mix. 😛 We do have creme fraiche, but it is a bit harder to find here in Canada (in my city anyway, but I do see it popping up more and more). It’s a bit easier to get in the USA from what I know. It’s sorta like sour cream. Every major food shop here carries sour cream. I like adding it to things like beef Stroganoff. Delish! I subbed in seared off chicken and for a longer boil (45 mins) plus adding in corn to give it texture. Thank you for this! Excellent! So happy it worked out. Has anyone used rice instead of pasta ?